Rest assure, kind readers, that after this post — my latest in the 2015 “summer travelogue” series — I’ll get back to commenting on topics that are fully ensconced in the public relations arena. But had to share thoughts and images from my visit earlier this week to what I’ll christen my new favorite Wisconsin town: Port Washington, or Port as the locals call it. So what about this former commercial fishing village 25 miles north of Milwaukee on Lake Michigan commanded my attention? Lots of stuff, as reflected in the photos below. 1. This Town Has Hills. In fact, there are seven hills in Port. The geography made for interesting (and at times, challenging) walking tours around town to visit places like the old light house and the St. Mary’s Church campus. But the good people of Port installed a convenient public stairway network to facilitate pedestrian travel and exploration. 2. Really Nice People. Really. From the lady at the Chocolate Chisel ice cream shop to the staff at ZuZu Pedals where I rented a bike for a few hours to the young guy at Smith Brothers Coffee Shop who brought me my delicious salmon wrap for lunch, everyone I met were genuine and welcoming. 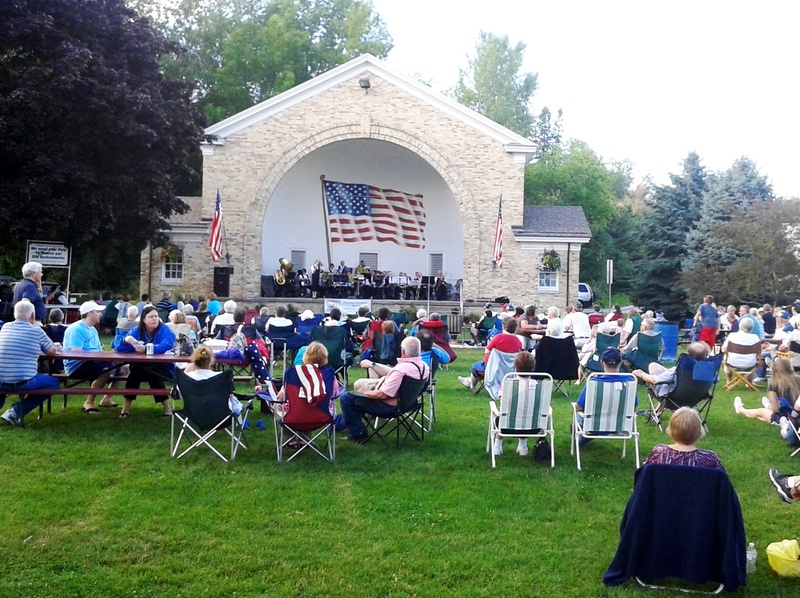 The people of Port demonstrated small town friendliness at its best. 3. Preserving the Past Well. As noted by some images below, Port has kept its architectural and maritime heritage intact. Yes, there are many modern buildings, and there’s even a big power plant along the waterfront, but they blended well into the streetscape. (Okay, the power plant is a bit imposing, but it has four towers, so I called it the “Titanic.”) Learn more by visiting the Historical Society website. 4. Yes, There’s a Harbor and Lots of Water. Well, it wouldn’t be called “Port” Washington without, well, a port. And the town has one, although now it’s a bustling marina with lots of charter fishing boats, pleasure power boats and sailboats. Strolling along the marina is a great way to relax and watch water, birds and of course, boats. Lots of people fish off the break walls. The view of Franklin Street looking north from my room at the Holiday Inn Harborside. The steeple of St. Mary’s Church can be seen from most places in town. 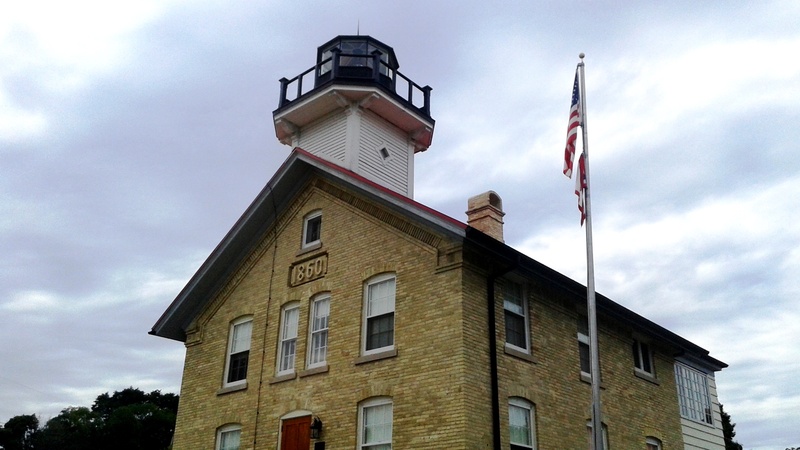 As noted, they like to preserve history in Port, including this cool old light house. It’s also a museum. The town is built among hills, kind of like Rome, I’ve heard. 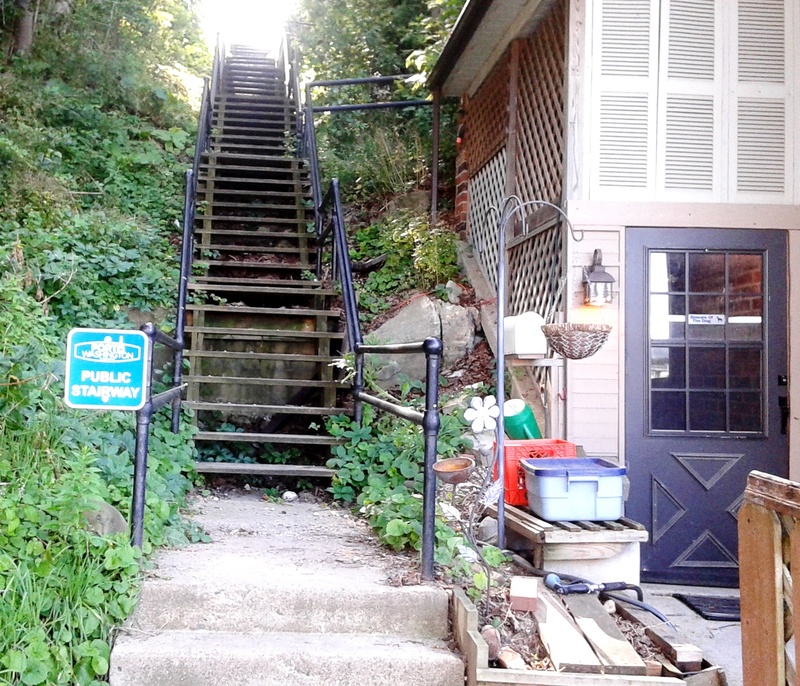 Public stairs, many adjacent to private homes, help you reach the top, where there are great views of the Lake and more. Looking north from Upper Lake Park just above the beach. Try to match this view anywhere in the Midwest. Try to match it anywhere there’s a large body of water. 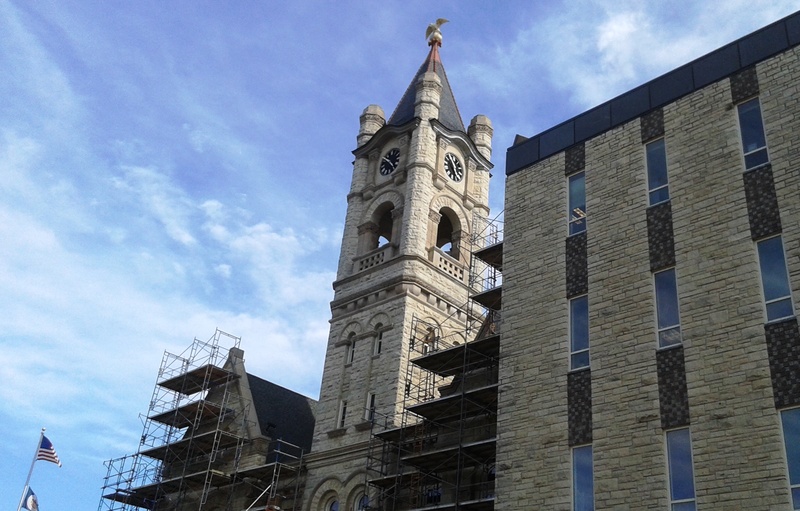 The awesome Ozaukee County Courthouse is under renovation. The stone masons working on the project were serious guys who spoke Italian. 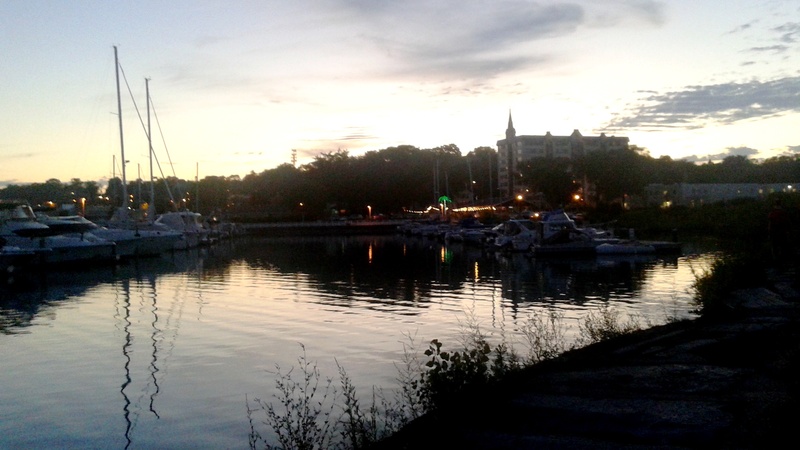 Yes, there is a working harbor and marina in Port Washington. Looking west with St. Mary’s in the distance. A great way to get the blood pressure down: Watching daylight fade from the marina. Ahhhh! A final thought: Each work day I board a rapid transit train to get to and from work. At rush hour, the cars often are at capacity of around 80 people. Spending a few days in an unhurried place like Port Washington proved the perfect antidote for the complexities of modern urban living. Want to revisit my past sojourners to the Dairy State? 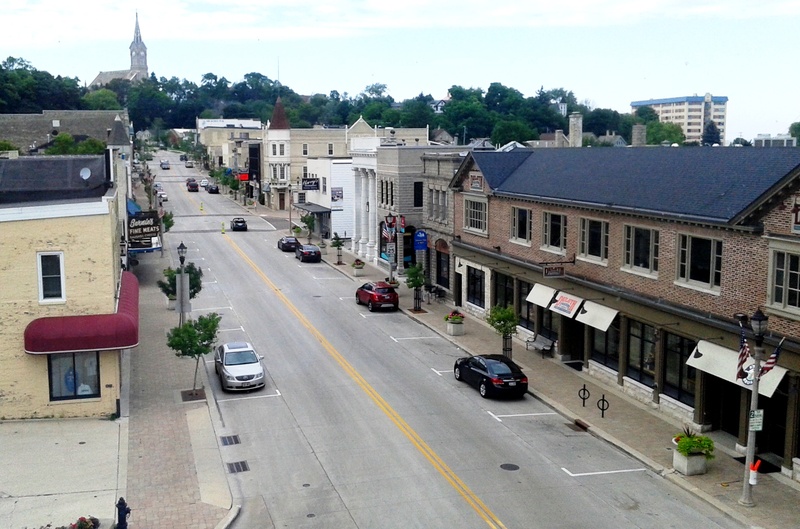 In late 2011, I prepared this post on Wisconsin in winter. In March of 2015, here’s a post on the Yerkes Observatory along Lake Geneva. Okay. My next post will tackle a public relations topic. Promise, but hope you enjoyed this travelogue. The end.